HOUSTON, Texas— Rep. Beto O’Rourke again revealed his hypocrisy to Texas voters by accepting support from a political action committee at a Washington, D.C. fundraiser, even though he campaigns in Texas against taking any support from political action committees (PACs). O’Rourke has previously told voters when discussing PACs on the campaign trail in Texas that “we will accept none of their help.” But when in Washington, he will accept support at a fundraiser hosted by a special interest PAC – the End Citizens United PAC, a group that has registered with the Federal Elections Commission (FEC) as a political action committee and that the FEC categorizes as a political action committee. 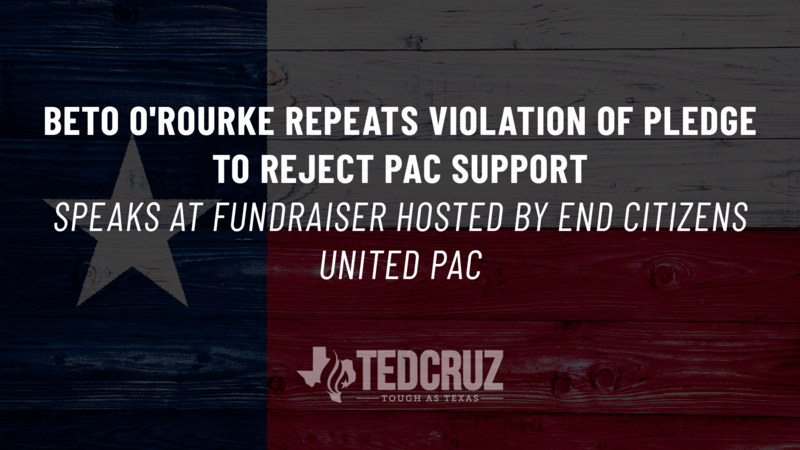 At last night’s End Citizens United PAC fundraiser, Rep. O’Rourke had the audacity to twice brag that he is campaigning without help from special interests or PACs. Yet the very event where he spoke was sponsored by a special interest PAC. (It is worth mentioning that it is already illegal for corporations to donate to U.S. Senate campaigns). “A political action committee essentially allows corporations or organizations to bundle contributions from their members and channel them to their members of congress and cut checks for $10,000 a pop…..this is the surest, fastest way to raise the money you need to serve your constituents…..For the last few years I haven’t taken any PAC money at all because I don’t want my constituents to wonder if on the arms services committee am I doing the bidding of the people of Texas or the Boeing corporation….by not taking PAC money this frees me from the perception but also from ever having that thought run through my head, do I really want to piss these guys off, they’ve given me so much money, it is so critical for my ability to raise for reelection…” Watch here. Video of O’Rourke’s speech at the End Citizens United PAC may be viewed here. His references to PACs may be found at time markers 9:13 and 20:15. This is not the first time O’Rourke violated his PAC pledge. Recent FEC filings revealed that he has accepted a total of $172,285 bundled by the anti-Israel J-Street PAC since being in Congress.